Playtime Twirl Skirt – Oh Sew Kat! Bitty Baby was always a popular doll here at our house. Oh Sew Kat! 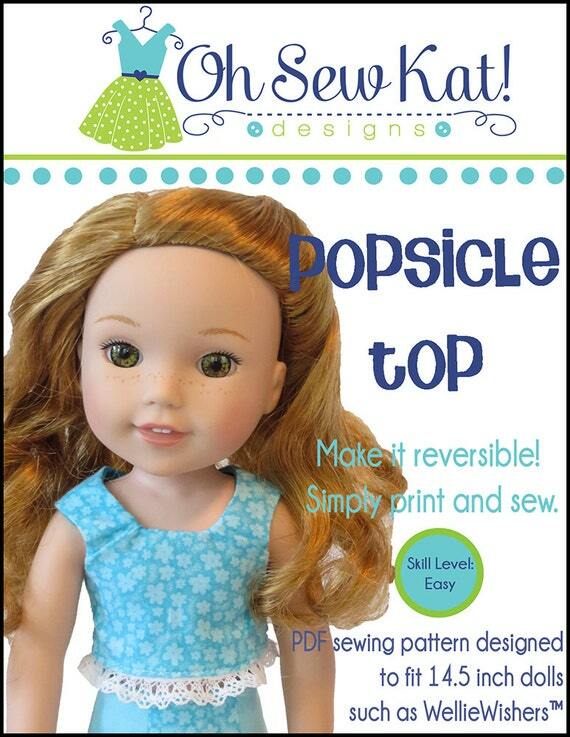 patterns are being resized (one by one) for the 15 inch baby dolls in your life. Find the Playtime Peasant Top and Twirl Skirt here. Scroll down to see the cute outfits the Oh Sew Kat! testers made with this quick and easy pattern for bitties! Carol G made this sunny pink and yellow outfit for her baby doll. Isn’t it the sweetest? Michelle A’s baby has a bit of a southwestern flair in her sunny top and skirt! 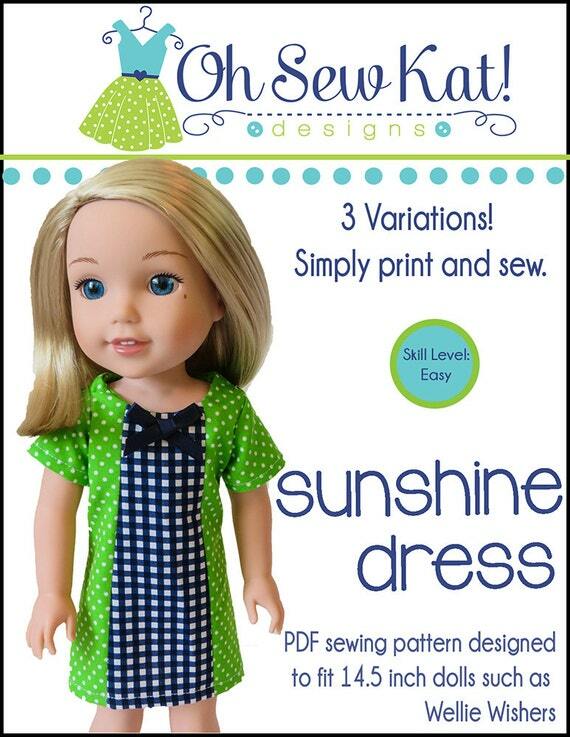 This pattern is the perfect pattern for those that are new to sewing. It has few pieces, easy lines, and simple elastic casings as both pieces pull on over the doll’s feet. Have fun mixing and matching prints to make your own unique play outfit for your baby doll. 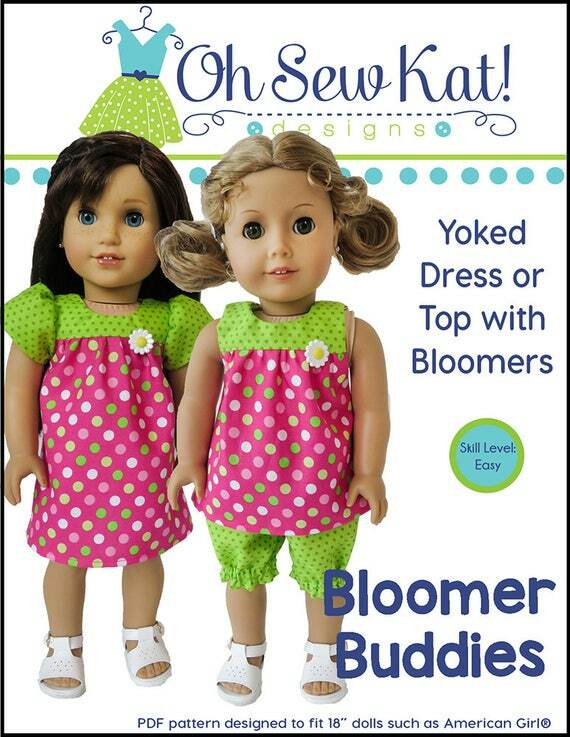 Find the pattern for 15 inch baby dolls here and it’s also available in 4 other sizes HERE. Get ideas and inspiration for this pattern in the Inspiration Gallery. Newly released!! 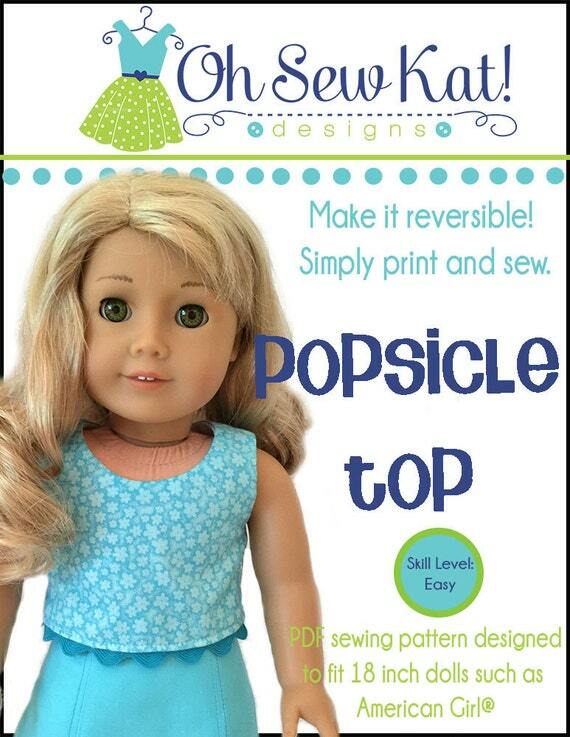 The Playtime Peasant Top and Twirl Skirt sewing pattern is now available for your A Girl for All Time doll. Find it in my ETSY SHOP to download and print on your home printer. 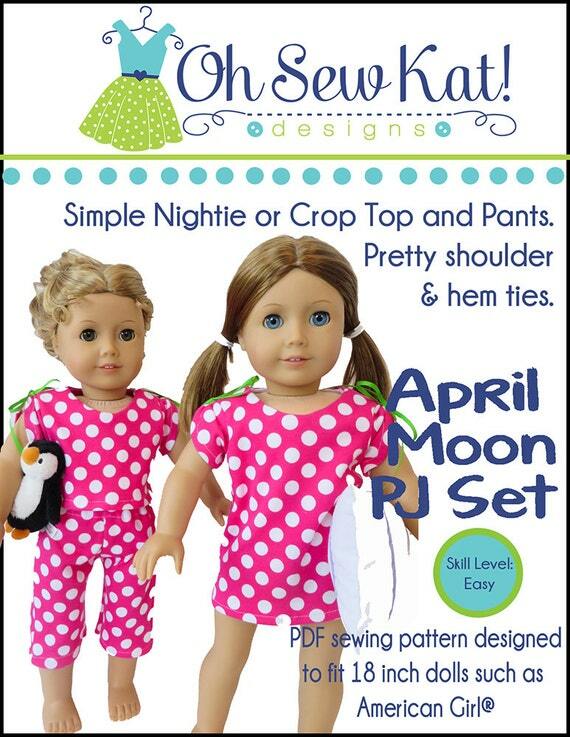 With three different sleeve lengths and a “dress” cutting line, you will love creating this basic outfit for your doll. See how to add the lace between the layers HERE. 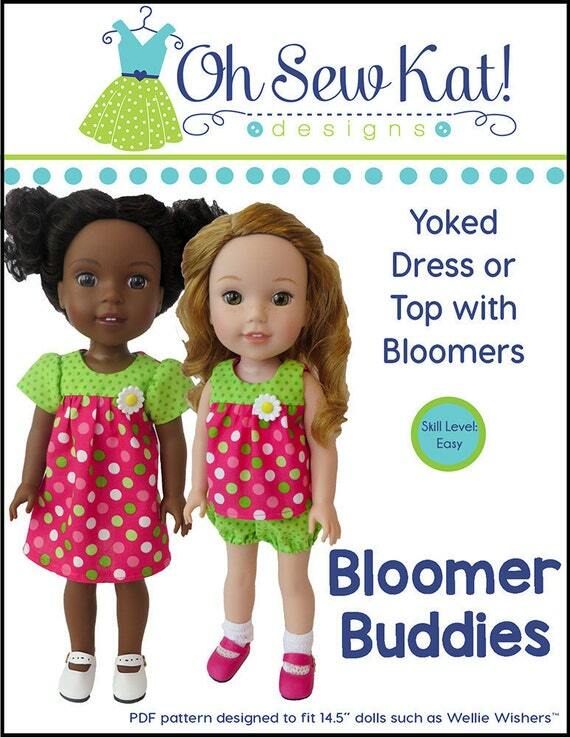 Look for more patterns for these lovely 16 inch slim dolls later this spring and summer! 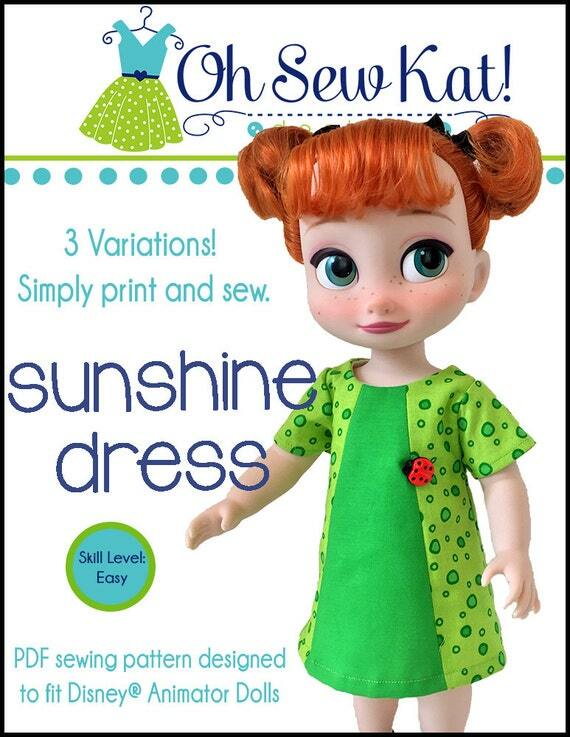 This easy to sew pattern is also available in other doll sizes (18 inch American Girl, 14.5 inch Wellie Wisher, 16 inch Disney Animator) in my Etsy store. Pam Ray, of Amy Violet’s fame, is here today with her beautiful Wellie Wishers dresses she made while testing the Party Time Peasant Pattern- the newest release from Oh Sew Kat! Find AmyViolet’s darling clothes for sale here! 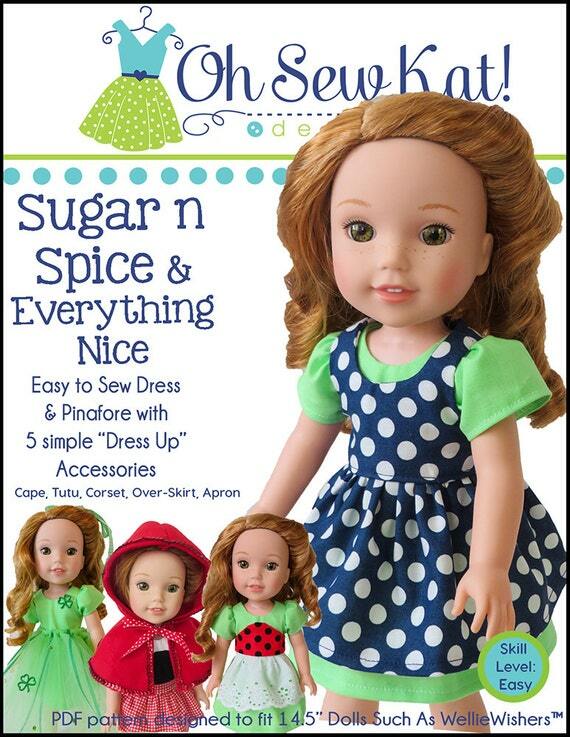 Find the Sewing Pattern for the Party Time Peasant Dress for Wellie Wishers and 18 inch dolls in my ETSY SHOP. Kendall is ready for the Fourth of July! She looks beautiful! This dress pattern is a quick and easy sew with an elastic neckline and sleeves! Pin these images so you can easily find them later! AmyViolet’s doll photography is amazing!! Maybe #americangirlbrand should hire her? JUST WOW! Quick, someone grab this adorable dress!! Already gone? Make your own! If these dresses are sold, you can make your own! The patterns offer photo step by step so even the beginnerist (is that a word?) beginner can make a cute doll dress! 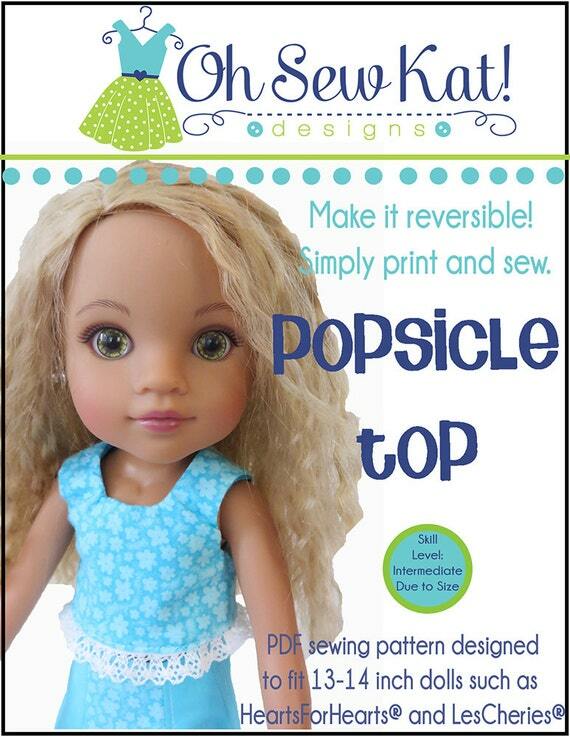 This pattern is also available for 18 inch dolls with more sizes coming soon! 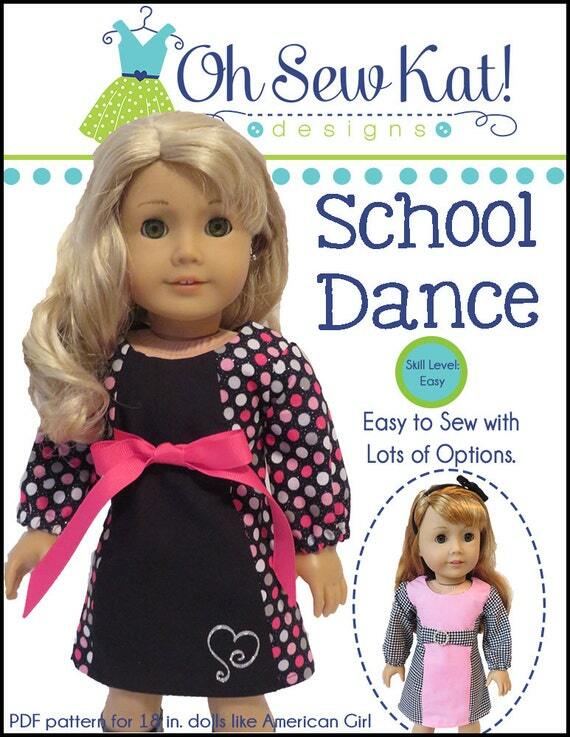 New Sewing Pattern for 18 inch and Wellie Wishers dolls: Party Time Peasant Dress by Oh Sew Kat! It’s time to Party!! 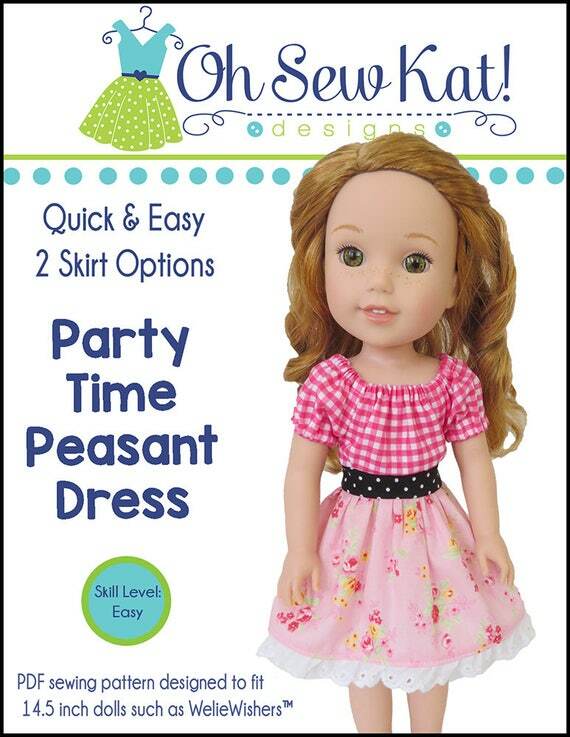 Your dolls will be ready for good times in their new Party Time Peasant Dresses. Warning!! It’s going to be hard to sew just one! 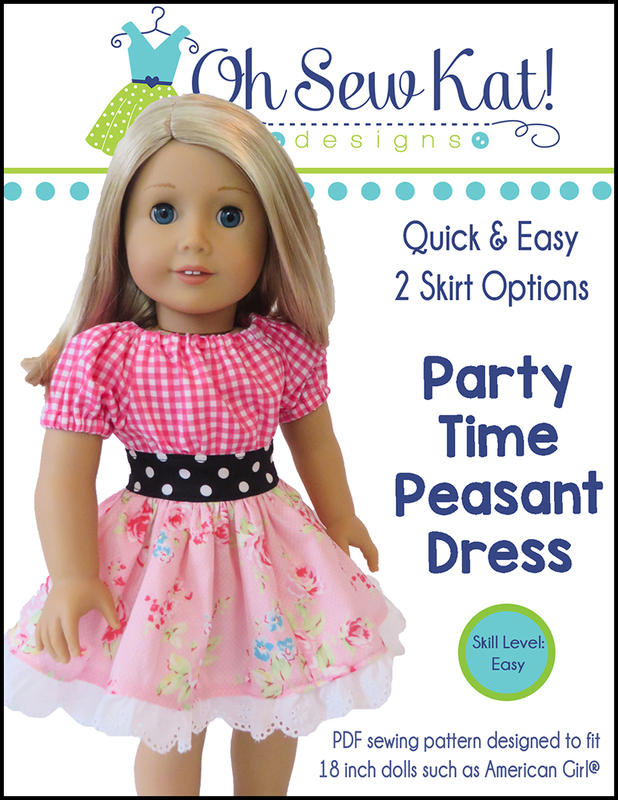 Click here to visit my Etsy Shop to get the Party Time Peasant Dress at a special INTRO price until Sunday, Jun 25th at 10pm EST. After that, the price goes UP! A twirl skirt, elastic neck, and pretty puff sleeves make this timeless dress perfect for every holiday and occasion on your doll’s calendar. Available now for 18 inch dolls like American Girl® and 14.5 inch dolls like Wellie Wishers ™ (coming soon in other sizes! ), choose your fabrics to create eye catching combos. There’s also instructions for a fun, three tiered skirt version! Visit my inspiration gallery or my facebook page to see more photos! Click here to take advantage of the special intro price! Here is a fun way to add a little more style to a simple “ruffled” skirt. Take your simple skirt, and give it a country western look! Try it out in denim and lace! Here I used the FOUR SEASON SKIRT pattern, which is free in three sizes when you join the Oh Sew Kat! Chat email list. You can also use this technique on the Playtime Peasant Twirl Skirt. 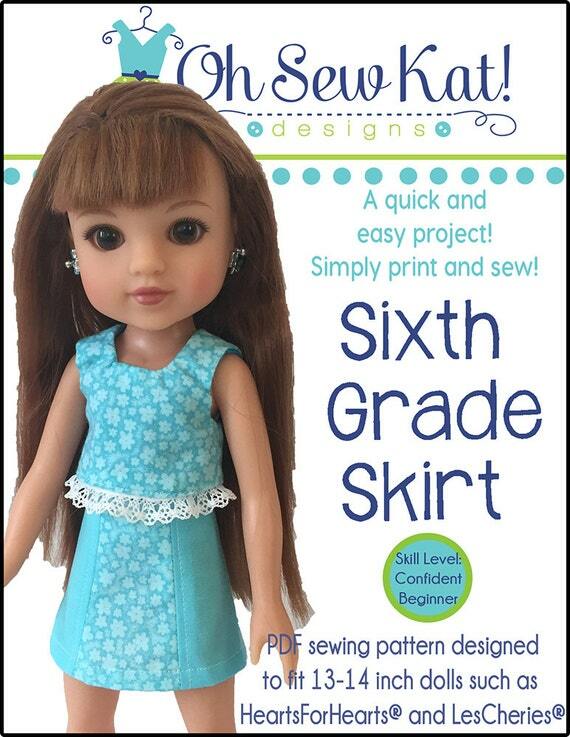 It’s easy to add lace to a ruffled doll skirt sewing pattern. Make a ruffled doll skirt with lace. Step 1. Gather your supplies and prep your lace. You will need a piece of lace that is the same length as your skirt measurement. If your lace is already gathered, you can add it to your skirt after you gather the skirt piece and before you attach it to the waistband. That will work, but I find it extra bulky to work with. Instead, I cut the edge off of my gathered lace (and throw it away) and then press the lace flat. Step 2. Follow the instructions of your pattern, and stitch the waist edge and hem edge as directed. Step 3. Lay out your skirt piece, and lay the lace along the top, raw edge with the RIGHT SIDE up. Pin, then baste the lace to your skirt. They should be the same length. Step 4. Gather your skirt piece as directed in the pattern, and continue with the rest of the directions. Ta Da! You’ve taken a simple, ruffled skirt, and given it a new look! 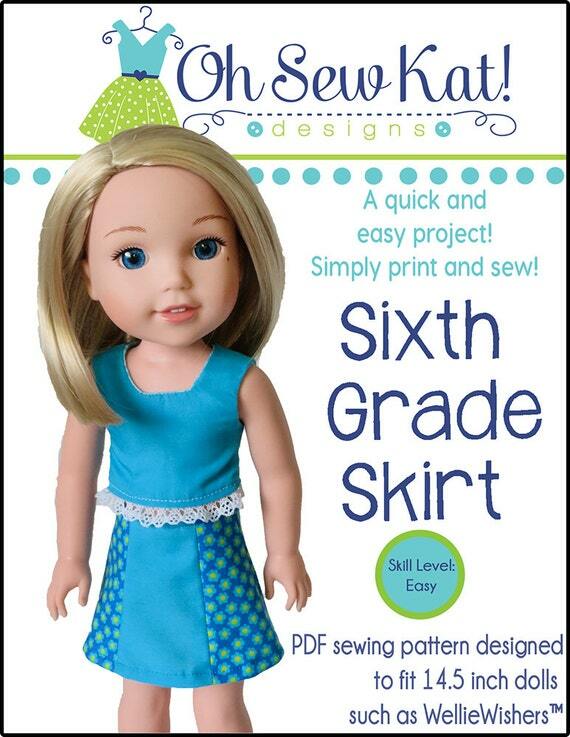 The Four Season Skirt is a quick and easy sewing pattern for 18 inch dolls. 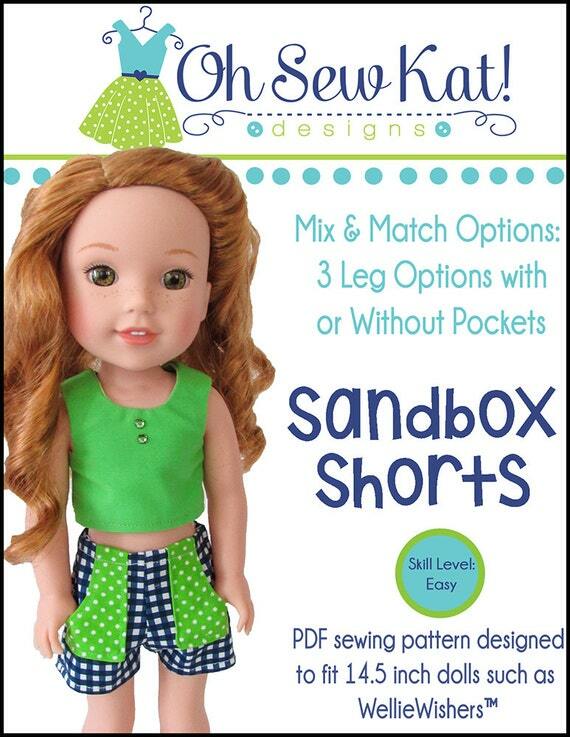 Create your own unique skirt with this easy sewing tutorial to add lace to your doll skirt. See more country and western doll fashions for Tenney and other dolls here. Find more ruffled skirts in the Inspiration Gallery. Donna Mancuso, of DMM Funky Frocks, takes a simple pattern and makes it specatcular. Just look at what she did with the Playtime Peasant Top! She sells her beautiful outfits on Facebook. Be sure to stop by and check out her shop. The Playtime Peasant Top and Twirl Skirt is available on ETSY. 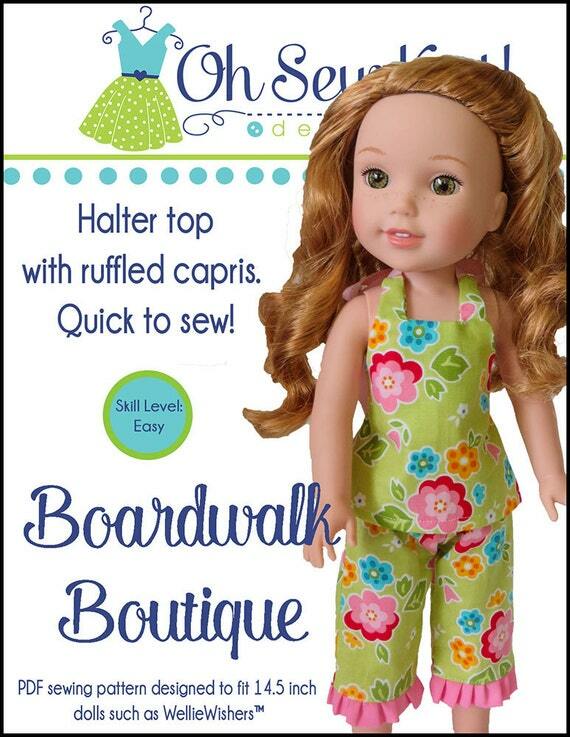 Find it for your American Girl Dolls, your Wellie Wishers dolls, and also Disney Animators. 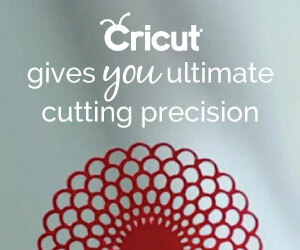 See more ways to use this versatile pattern in my INSPIRATION GALLERY. Find the Playtime Peasant top in my Etsy shop and download and sew today!! Also available for 18 inch and Animator sized dolls. 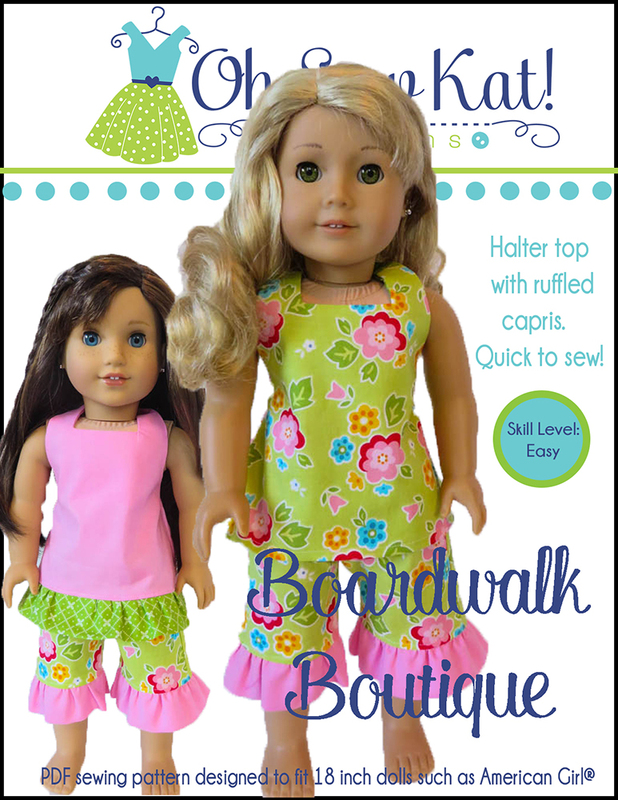 Visit my Inspiration Gallery to see more Playtime Peasant Tops and Twirl Skirts.